So there I was, sat creating my test site for this Site123 website builder review. My first impression was how simple it was to use. In fact, it was a pleasure. I started to think I had uncovered a hidden gem and maybe I have. But, the more I used Site123, a few tiny cracks began to appear. With that said, let’s go and take a closer look at what this website builder has (and doesn’t have) to offer. Simple to use. You create your site by walking through the “Wizard” menu. Mobile friendly. Your site will automatically adapt to fit tablets and smartphones. Plenty of easy to use design tools to customize your site and make it your own. Free stock images. If you don’t have your own, you can choose from a library of royalty-free stock photos. Choose between a single page or multipage site. Ability to create a multi-lingual website. Add an online store and sell physical and digital products. App Store to add functionality to your site such as booking forms etc. Create multiple websites under a single account. 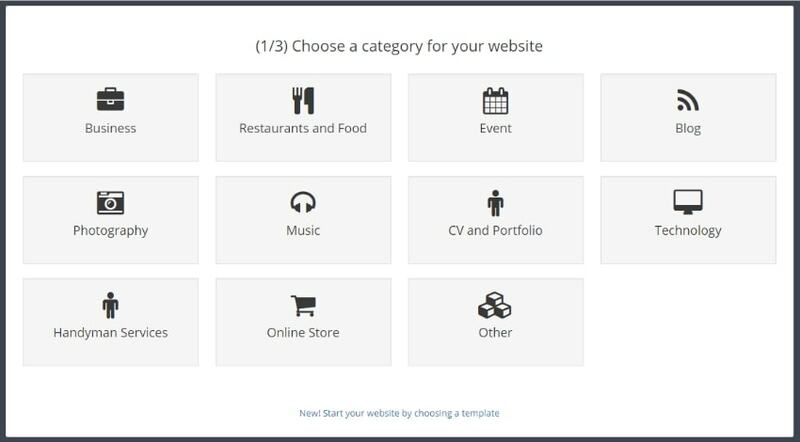 Choose what type of site you wish to create. For example; “business or photography” and everyone starts with that particular template. Quite basic search engine optimization options. Premium Plans: Ranging from $9.80 – $27.80 per month (billed annually). 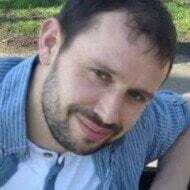 Lee’s Recommendation: A great choice for single-page or multi-lingual websites. Site123 can also handle hobby and business website as long as they aren’t too complex. If you’re looking to sell a few products, you can definitely do this. Although it’s an all singing, all dancing online store you’re after, you might be better off with a more specialized eCommerce platform. Ready To Get Started? Click here to try Site123 for free. 2. Is Site123 Easy To Use Use? 5. What About Your Mobile Visitors? 8. Pricing – How Much Will It Cost? Setting up a personal or hobby website/blog. Looking to create a smooth, slick looking “One-page” website. A small business owner wanting to advertise your business and require clients to be able to schedule appointments online. Intending to sell a few products online now or down the road. For a full-blown store, you may be lacking certain tools. Someone looking to create a multi-lingual website. If you’re experienced in website creation, require advanced eCommerce tools, or are planning on creating a large or complex site, there may be a better alternative out there for you. The website editor is where I believe this platform really shines! After testing many website builders, I’ve gotten used to clicking directly on a piece of text or an image to edit it. Or, simply picking up a particular element and dragging it to somewhere else on the page entirely. That’s not how Site123 works. Believe me, I spent a least two minutes clicking on things wondering why nothing was working (**blushes). In fact, the only time you click on the page to change something is with an image. You’ll find an icon on the right-hand-side of the page which when clicked, will give you the option of choosing one from the library or uploading one of your own. Everything else is done by using the special “Wizard” menu on the left-hand side of the page. I have to admit, I’ve used other website builders that work this way in the past and I either I didn’t like them, or found they had a steep learning curve. This one’s different. It’s easy to get the hang of and my experience while creating my test site was a pleasure. 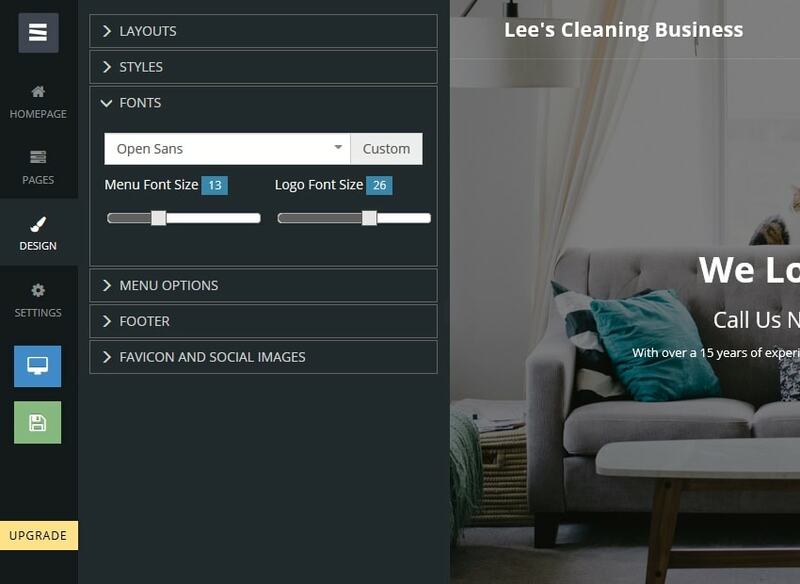 To get started, simply click on one of the icons in the menu and it will bring up a list of customization options from adding/editing pages, changing the layout, choosing fonts, link colors and menu options and many more. Any changes you make take place in real time on the screen in front of you in true “what you see is what you get” style. There are far too many platforms out there that don’t give users the ability to truly make the site their own and restrict them from making too many changes. Fortunately, Site123 isn’t one of them. This is the first feature that left me feeling a little disappointed. At first anyway. With nearly all of the website builders I’ve reviewed in the past, you usually get a fairly wide selection of designs to choose from. Think of these design templates as a starting point for your site rather than working with a blank canvas. Sometimes there will be 50+ rather generic templates to choose from which I consider to be on the low end, other times there are 500+ and they’re industry specific to such as florists, plumbers, and lawyers. This means if I created my test site today, and you created your website next week and also chose the same category, we’d be using the exact same template. The downside to this is, if you don’t intend to do too much customization, you could end up with a website similar to thousands of others which, to be honest, isn’t ideal. 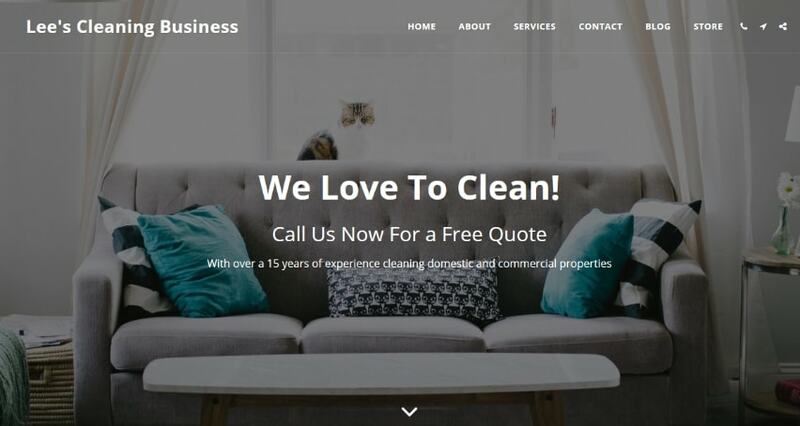 It’s not all bad though, because the template is so customizable, with a few hours work adding your own text and images, you’re site will look completely unrecognizable from the template you started with. Especially if you use real-world photos of your business, products, or photography etc. The other thing I like about the template is that you can click on any page and choose a different layout which will take immediate effect. 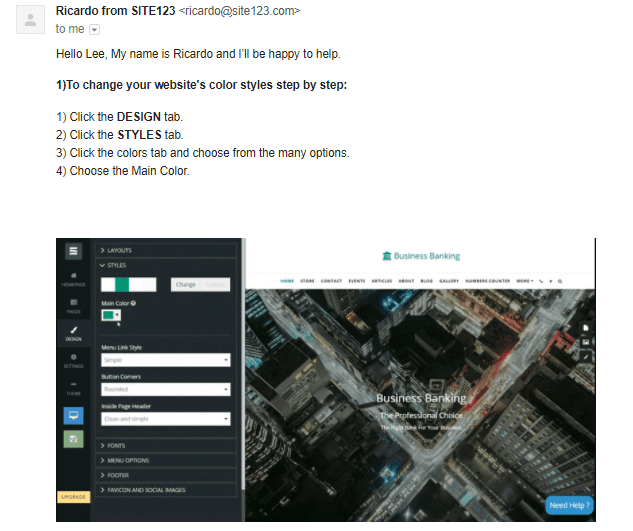 While I am used to true drag-and-drop style builders where I have more control over where I can place certain elements, I really didn’t miss that feature with Site123’s templates. =>If you’d like to choose from over 500 industry-specific templates, click here for my Wix review. Almost all website builders have certain features that help them stand out from the crowd and Site123 is no different. Quickly and easily add a blog. Plenty of options to spruce up your blog posts such as different fonts, sizes, bullet points, options to add images, video, and quotes. 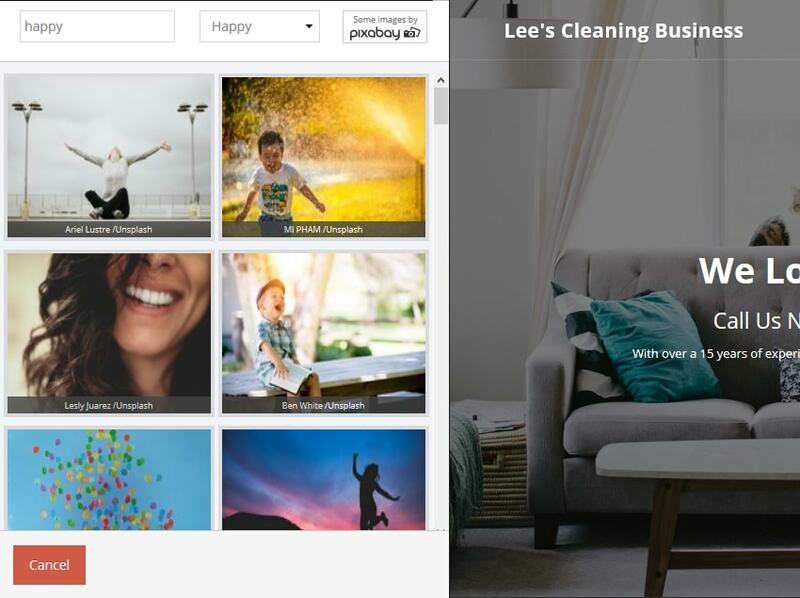 Stock Images: If you haven’t got your own snaps, you can choose from a large library of royalty free images as I did with my cleaning business test site. You can add these images to your site with a single click. Create a multilingual website: Duplicate your site in a different language. Choose up to 5 different languages (depending on your plan). Each version will be able to have its own unique web address. App Market: With a premium plan, you can access the App Market where you can choose certain features for your site. 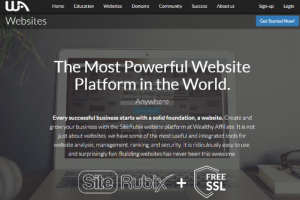 While it may not have quite as many apps as Wix or Weebly, they can help you to create a very functional website. 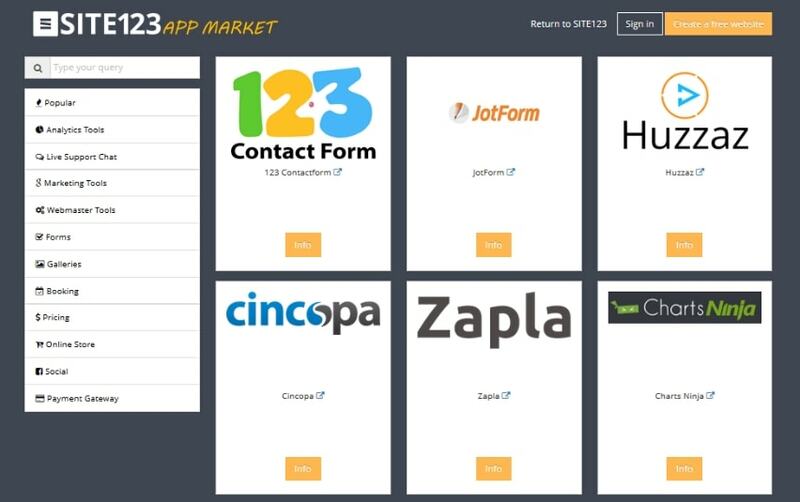 The apps include contact forms, booking forms, payment gateways, visitor analytics, promotion bars, forms to collect visitor information, live chat functionality, and social media integration with a few more to boot. These apps are from third party companies. You’ll have to integrate these into your site which is a fairly simple process and walkthroughs are available. The last thing to note is, some of the apps have a free trial only. Others have a free plan with upgrade options. Pricing will vary from app to app and will be in addition to your Site123 plan. Many people worry that once they’ve created their site, they’ll have to also create a separate mobile version for people using tablets or smartphones. Let me put your mind at rest. Once you create your site, it will automatically resize to work correctly on these mobile devices with no additional work required. One final thing that I like about the mobile sites is that there’s a little phone icon in the menu bar that when clicked from a smartphone, your number will pop up asking the visitor if they wish to call. A nifty little feature that not every website builder offers. If you don’t know what Search Engine Optimization is, in it’s most basic form, is having the ability to correctly name your pages and URL’s to show visitors and search engines what the page is about. Site123 offers the basics and allows you to add titles and descriptions on a sitewide basis as well as individual pages. Personally, I like to customize the URL of each page of my site for example; yourwebsite.com/contact. Unfortunately, this isn’t possible and the web address for each page is automatically generated. The other thing that I would have liked to be able to do is to add descriptions and alt tags to my uploaded images for the visually impaired. Again, there is no way to do this. 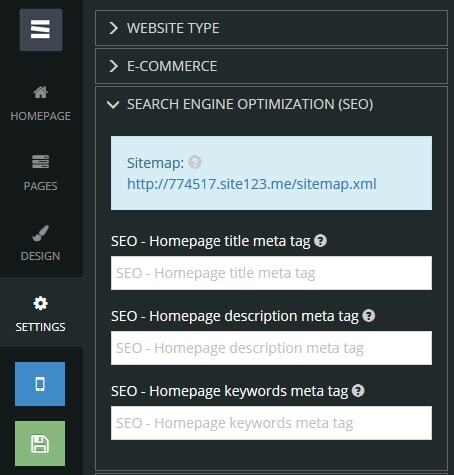 So that we end this section on a positive note, Site123 does automatically create a sitemap. This informs the search engines of all the pages on your website and helps to “show them around”. When Google can understand your site, it can result in better rankings in the search results. Credit where credit’s due. I like any website builder that offers an in-house eCommerce platform enabling users to sell products online. Site123 ticks this box and may be a good choice for you if you intend to sell a few products from your site either now, or a little further down the road. Create variations of those products such as size or color. Add weights to each product (for shipping purposes). Allow your customers to use coupons. Accept payment via PayPal or Stripe allowing you to accept major credit cards. I managed to integrate a store and start adding products with ease. However, I do feel the eCommerce features may not be ideal if you intend to create a full-blown online store due to the lack of advanced tools such as real-time shipping rates and abandoned cart recovery to name just two. The number of sales you’ll be allowed to make each month will vary depending on your which plan you choose. We’ll be looking at pricing in the next section. When you first create your account, you’re offered either the free plan or a free trial of a premium plan costing $9.80 per month leading you to believe they are the only two plans available. That’s not the case as once inside, you can choose to upgrade from between 5 different plans which we’ll take a brief look at now. **Note: All prices below are in US dollars and for a one-year plan which is billed annually. Site123 also offers a three-month contract which costs more (per month) and you’ll lose some of the plan features. There are also two and three-year plans available which offer a larger discount. The main benefit of the free plan is that it allows you to test out Site123 without any risk. When you create your free account your website will have a free subdomain (web address) that will look something like 774517.site123.me/. You’ll find that many of the features are restricted and you’re site will also display ads. It also allows you to remove some of the ads and you can also add a store to your site and will be allowed to make up to 10 sales each month. First off, you have everything from the Personal plan. In addition, the Business plan allows you to remove all branding, you’ll be given more website space and storage. You’ll be able to create 2 personalized email address and be able to make up to 50 sales per month. Finally, you can add a different language to your site if you intend on creating a multi-lingual website. 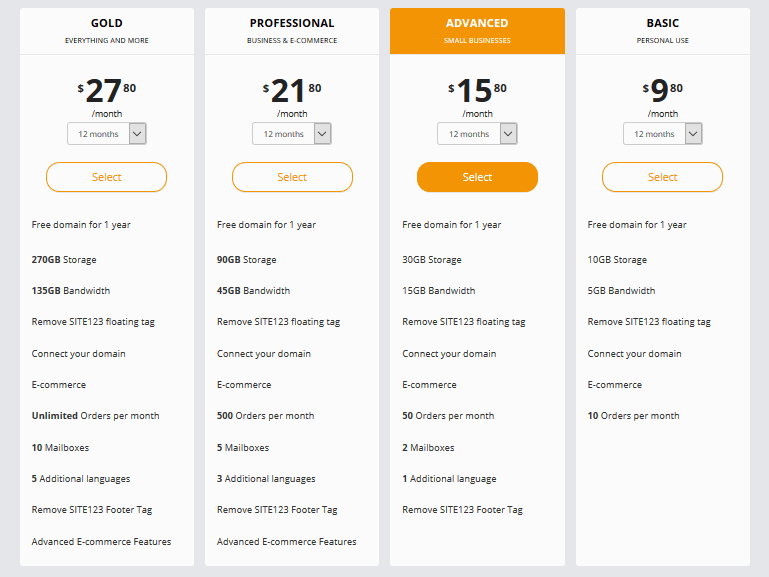 The benefits of the professional plan are that you have more website space (45GB bandwidth) and more storage space (90GB). You can create up to 5 email addresses and add 3 more languages. For online stores, you’ll be able to make up to 500 sales per month including digital products. You can also offer customers coupons. More bandwidth and storage space, 135GB and 270 GB respectively. You can make unlimited sales per month, create up to 10 email addresses and add an additional 5 languages for multi-lingual sites. Site123 has pages of written and/or video tutorials that walk you through many aspects of creating your website. When you need to speak to a real person which is a distinct possibility when creating your first website, you can contact them through a form on their main contact page or through live chat. To be honest, I’ve heard from other reviewers that the support is lacking but from in my experience, I found it to be outstanding. First, I tried live chat and was very happy with the chat operator who solved my query quickly and efficiently. Next, I fired off a message via their contact form with a couple of questions. To my surprise, I received a thorough response less than 5 minutes later! Just to make sure it wasn’t a fluke, I contacted them again an hour later and received my response within the same time frame. I have to say, I think that’s the quickest email support I ever received and I’m very impressed. Whether it will be the same for you is a different story, I can only share my own experience. If simplicity is your major concern, then Site123 could possibly be exactly what you’re looking for. The App Store provides plenty of features allowing you to create a functional website. By design, Site123 is a great option if you’re looking to create a smooth, slick one-page, or even a multi-lingual site. It can also handle multipage business sites as long as they aren’t too complex. If you wish to sell products from your site then you can definitely do this but if you’re looking to create a full-blown store, a more advanced set of eCommerce tools may suit you better. Regardless of what I say, the only way you can really know if Site123 is the right choice is to test it out for yourself. Spend an hour with it, and in that time you should be able to decide whether you Site123 is right for you. Ready to take Site123 for a free test drive? Click here to get started!